Cunningham Falls in northern Maryland tumbles 78 feet down a set of cascades, making it the tallest waterfall in the state and a popular getaway destination for residents of the DC/Baltimore area. 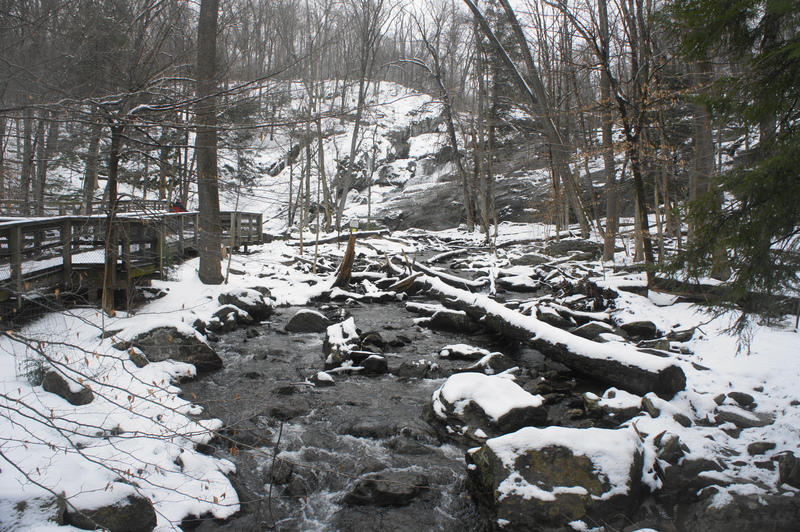 Most visitors hike to the falls by way of Cunningham Falls State Park—but it is also possible to reach from neighboring Catoctin Mountain Park, a lovely National Park Service unit outside Thurmont, Maryland. The Falls Nature Trail provides a moderately challenging, up-and-down walk to the base of the cascades. Begin this relatively short but steep hike from the overflow parking area across Park Central Road from the Visitor Center in Catoctin Mountain Park. (Note: As of March 2019, this parking lot was closed for construction, but there was other parking available at the Visitor Center.) 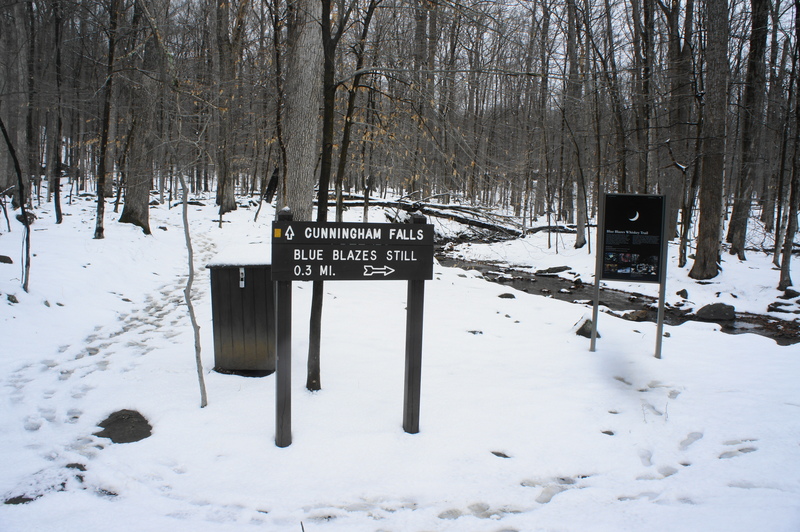 From the parking area, walk north on a wide trail before reaching a fork; a short trail to the Blue Blazes Whiskey Still heads right, while the orange blazes lead left to Cunningham Falls. The Falls Nature Trail starts relatively level, quickly crossing over a minor stream within the first 100 yards. 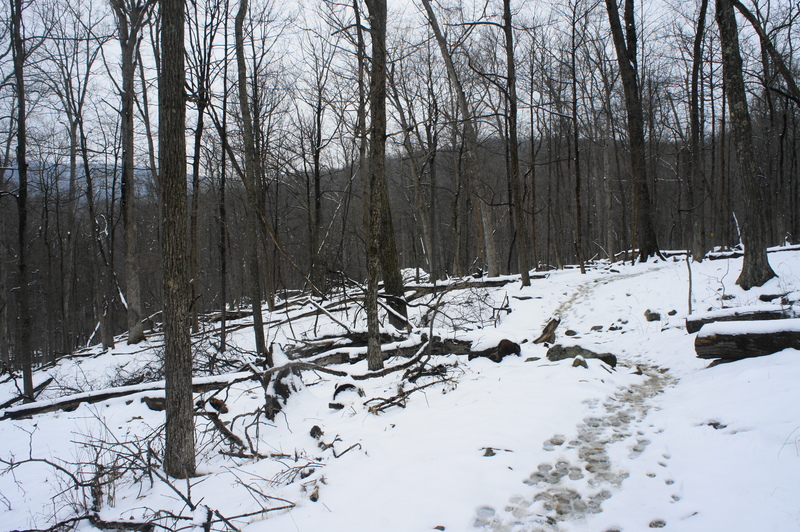 Thereafter, however, the path climbs steadily, cresting the first of many ridgelines at about the 250-yard mark. With Foxville Road (Maryland Route 77) visible down to the left, the trail levels off briefly, then climbs again. By now, it is clear that the short distance of the hike—1.25 miles one way—and seemingly straightforward westerly direction are deceptive: the Falls Nature Trail ascends rugged and rocky terrain, with a surprising number of uphill slogs. Cutting through the heart of the Catoctin Mountain Range, the trail crests another hill at 4/10 miles, then descends for a brief moment. Soon enough, it is up again, treading southwest with occasional views of the valley and road below. The terrain gets rockier as you progress, with one particularly steep section at around 7/10 mile. Within a few minutes, a rock outcrop emerges on the right, leading to another mild ascent. By now, the trail has gained around 300 feet in elevation to roughly 1,250 feet in total, about 100 feet above the elevation at the base of the falls. The much-anticipated descent comes just before the 1-mile mark, with the trail dropping sharply to cross Foxville Road. (Note: Just before the road, the trail splits—stay left; the right fork heads steeply uphill toward Hog Rock.) After carefully traversing the road, hikers leave Catoctin Mountain Park and enter Cunningham Falls State Park. An information kiosk provides information on the park, with a wooden boardwalk beyond that takes hikers to the base of the falls. 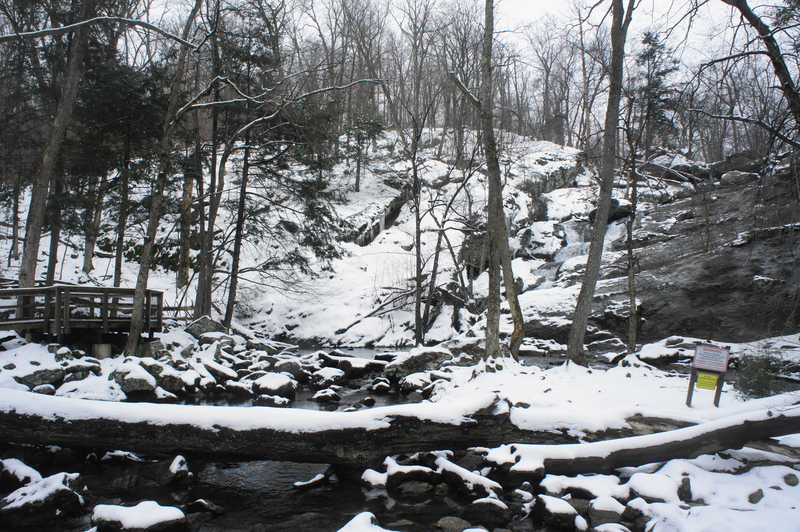 The roar of Cunningham Falls becomes audible as hikers following the boardwalk over a fork of Hunting Creek. The hike ends abruptly at about 1.25 miles, with views of the tumbling falls. 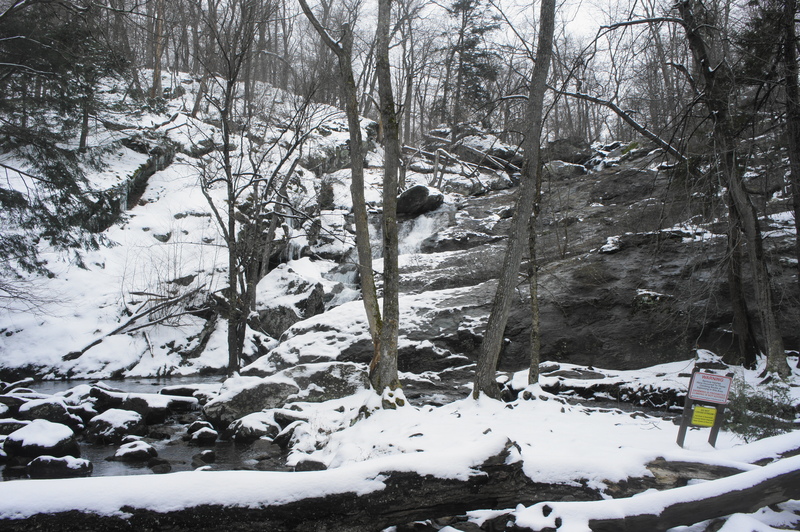 While not quite as good as the vista from the adjacent boardwalk on the state park side, it is still possible to see the cascading waters as they leap down the grey greenstone. Warning signs discourage visitors from approaching the falls, but a couple of benches at the end of the boardwalk offer a place to sit and admire the waterfall. Unfortunately, there is no connector to the other boardwalk (and associated Lower Trail), so hikes must trek back the way they came, this time enjoying considerably more downhill than the incoming journey. 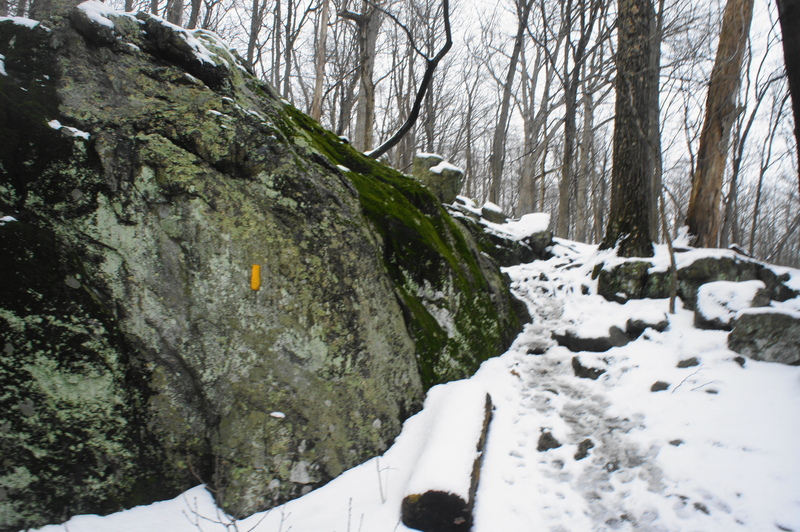 Adventurous hikers can continue northward to Hog Rock and beyond, but most will return straight to the Visitor Center. Visitors can expect to take 1.5-2 hours for the 2.5-mile out-and-back hike. Experience the area’s history as a regional hub for moonshine on the Blue Blazes Whiskey Trail, or drive to Cunningham Falls State Park to see the falls from the superior viewpoint. This entry was posted in Catoctin Mountain Park, Cunningham Falls State Park, Maryland, Moderate Hikes and tagged Catoctin greenstone, Catoctin Mountain, Catoctin Mountain Park, Cunningham Falls, Cunningham Falls State Park, Falls Nature Trail, Maryland, waterfall. Bookmark the permalink.